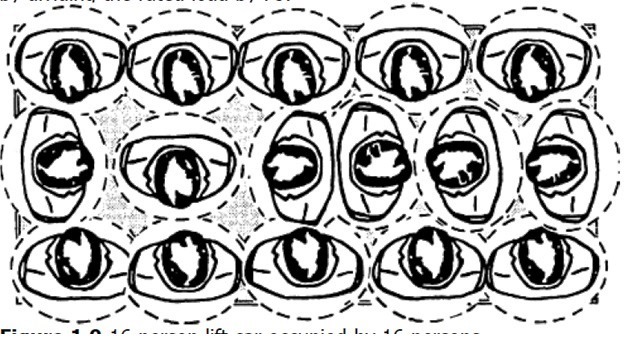 And I explained the first two methods: Ohm’s Law Method and European method in this Article. Today I will continue explaining other methods for Voltage Drop Calculations as follows. 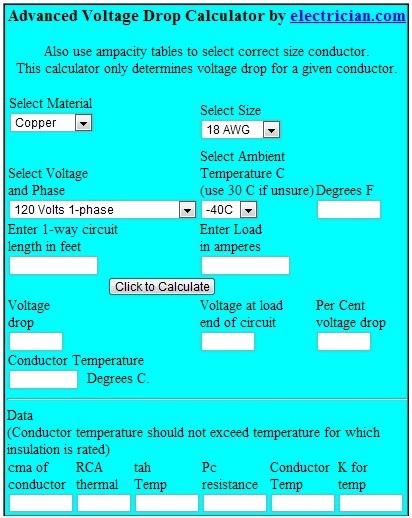 This Calculator calculates voltage drop by finding the actual approximate operating temperature of the conductor and using the conductor's resistance at this temperature. When using the calculator the conductor's insulation temperature should not be exceeded that would be a maximum of 90 degrees C plus 5 degrees for rounding off since the calculator is intended to solve voltage drop problems for building wire listed in Table 310.16 of the NEC. For practical NEC applications any voltage drop calculation must also be complimented with an ampacity determination usually done by looking up ampacity in Table 310.15(B)(16). 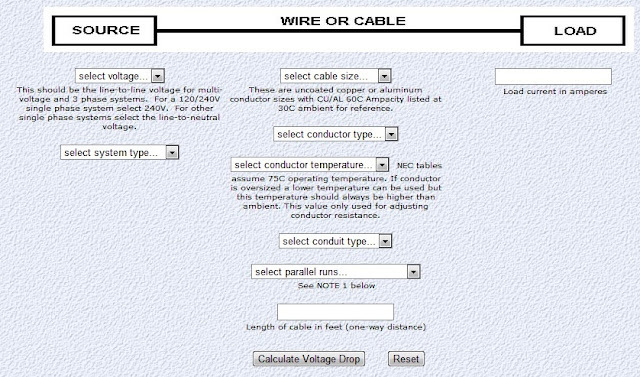 The calculator was designed for Table 310.15(B)(16) conductors only and is an approximation since RCA (thermal resistance in thermal ohm feet) is calculated using only the 75 degree columns. The conductor temperature should not exceed the respective temperature for the insulations listed that are 60 degrees C, 75 degrees C. and 90 degrees C. Also the thermal resistance values used in the calculator were determined using only the 75 degree column. This is not exactly correct for the 60 and 90 degree columns since the ampacity in the 75 degree column that was used in this reverse calculation method is actually a rounded off value, rounded to the nearest 5 amperes. A more accurate method would be to determine the thermal resistances from all three columns, 60, 75, and 90 degrees C and then find the average value. Howerver, if the respective ampacities from each of the columns is used in the advanced calculator the 60, 75, and 90 degree temperatures are fairly accurate. For instance for No. 4 Aluminum 65 amperes calculates to 75 degrees C, 55 amperes results in 60.7 degrees C, and 75 amperes results in 93.5 degrees C as the conductor temperatures. The State of Washington Labor and Industries will not allow the use of this calculator. 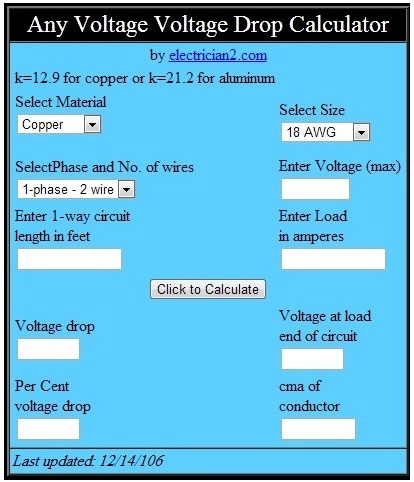 They require using the k method with copper K = 12.9 and Aluminum K = 21.2 that assumes a conductor operating temperature of 75 degrees C.
Select the material either copper or aluminum, the size of the conductor, the voltage and phase from a list of common voltages, then enter the one way circuit length in feet, and load in amperes. This Calculator finds voltage drop, per cent voltage drop, and volts at end of circuit. Select the material either copper or aluminum, the size of the conductor, then enter the voltage, the one way circuit length in feet, and load in amperes. This Calculator finds voltage drop, per cent voltage drop, and volts at end of circuit. Select the material either copper or aluminum, the size of the conductor, the voltage and phase from a list of common voltages, then enter the maximum voltage drop in per cent and load in amperes. 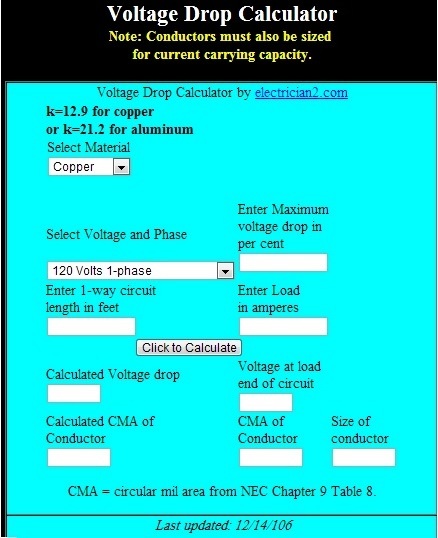 This Calculator finds minimum conductor size, voltage drop and volts at end of circuit. Select the material either copper or aluminum, the size of the conductor, the voltage and phase, then enter the volts, maximum voltage drop in per cent and load in amperes. 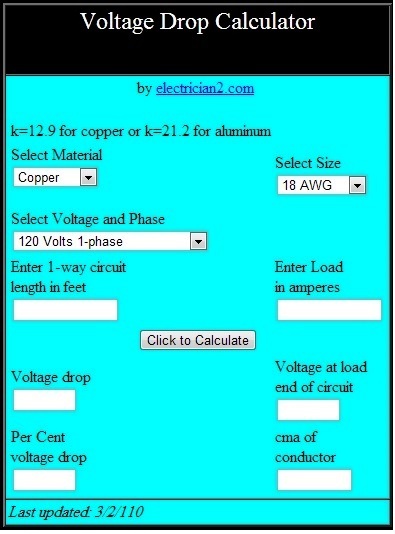 This Calculator finds maximum conductor length in feet and volts at end of circuit. Select the system parameters which are material copper or aluminum, the phases single or three and the installation method to be direct buried, conduit or overhead. Enter the input parameters which are voltage, maximum voltage drop in per cent, Length of Cable Run in feet and current at the end of cable run in amps. 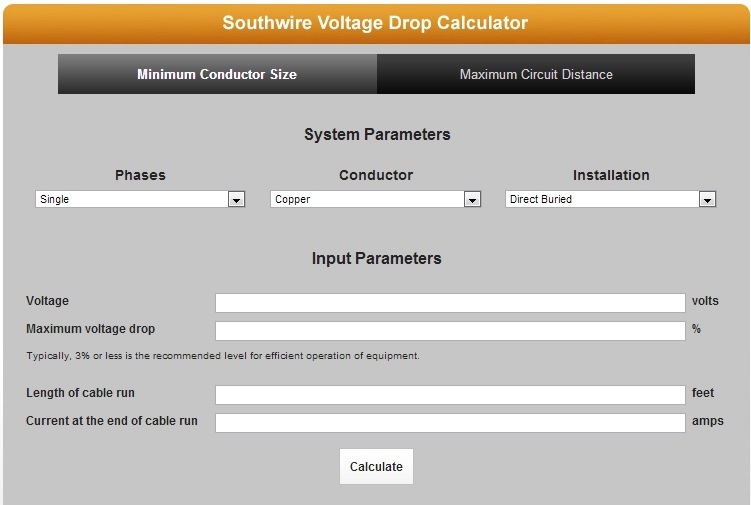 Enter the input parameters which are Conductor Size, voltage, maximum voltage drop in per cent and current at the end of cable run in amps. All ampacity values are taken from the Section of 310-15 of the NEC. The conductor characteristics are taken from Table 9 of the NEC. The calculations used to determine the recommended conductor sizes for branch circuits are based on 60°C ampacity ratings for circuits rated 100 amps or less or marked for use with #14 AWG - #1 AWG. Circuits rated over 100 amps or marked for conductors larger than #1 AWG are determined using 75°C ampacity ratings. Calculations to determine service and feeder conductor sizes are based on overcurrent device ratings rather than actual expected loads which are conservative and may yield oversized conductors. No calculations take into account temperature correction factors or conductor de-rating. 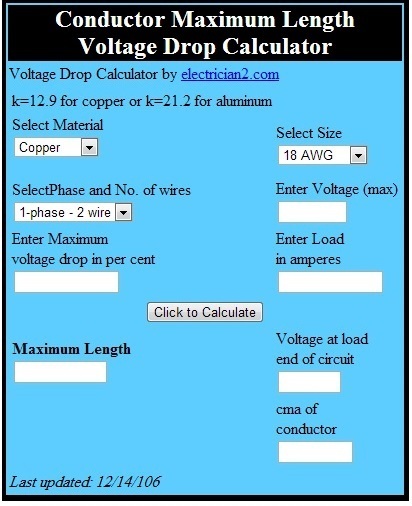 This voltage drop calculator is applicable only to NEC applications. It does not optimize conductor sizes for several different loads at various points in a circuit. The total combined load and length of the circuit must be used. Consult with an engineer if your application requires more complex engineering calculations. 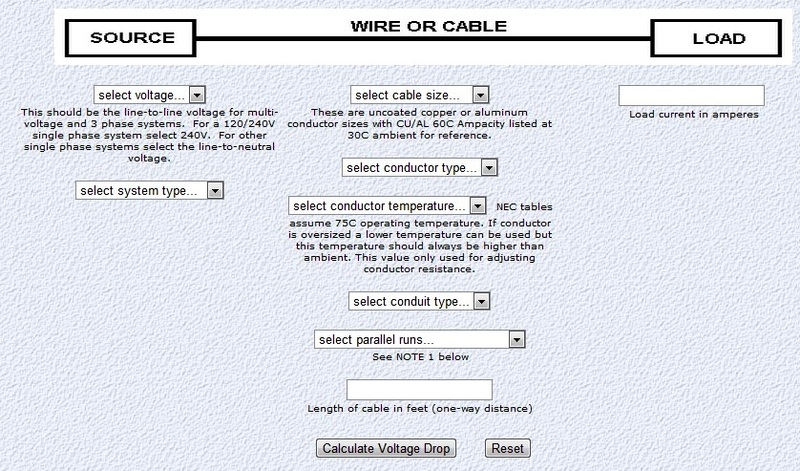 Use this calculator to estimate cable voltage drop for sizing conductors. The calculation assumes uncoated copper or aluminum conductors operating at the temperature selected and is based on the ac/dc resistance or impedance from NEC Tables 8 and 9 for stranded conductors operating on a DC or AC 60Hz system. 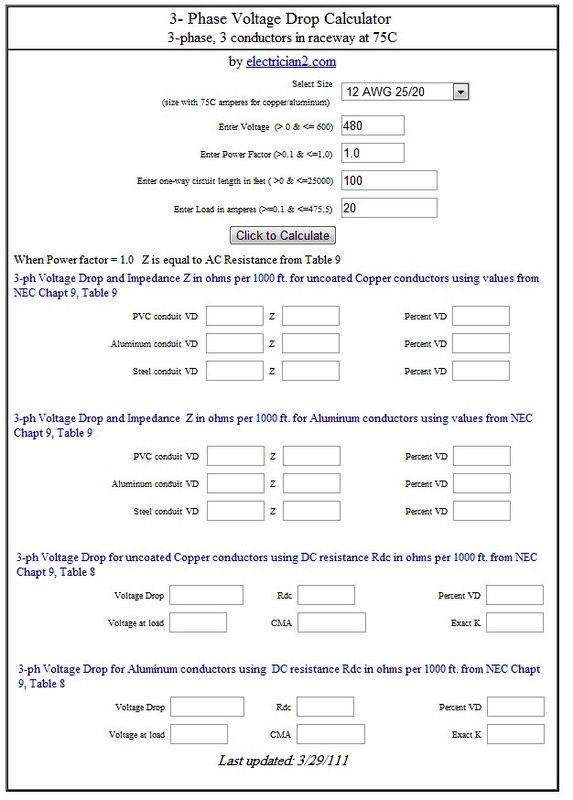 The ampacity of each conductor size in the dropdown menu below is based on NEC Table 310.15(B)(16) for 60C insulated conductors rated 0 through 2000 volts with not more than three current carrying conductors in raceway, cable or earth with an ambient of 30C (86F). The actual ampacity and voltage drop for your application may differ from these results but in most cases will be very close to those shown here. Voltage drop for ac systems should total no more than 5% under full load conditions. Drop may be significantly larger during surge or motor starting conditions -- sometimes in the 15% to 25% range if other devices on the system can withstand this momentary dip. Voltage drop for dc systems should be designed as low as possible or less than 2%. For most 120/240V systems using cables of adequate ampacity, voltage drop is not a concern unless cable lengths are well over a hundred feet. In the next Article, I will continue explaining Other Methods for Voltage Drop Calculations. 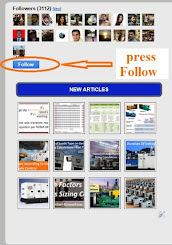 Please keep following.